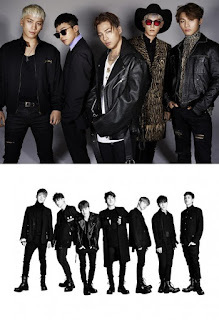 BIGBANG and iKON will both appear during the biggest music festival in Japan, a-nation. This year the festival will take place in the Ajinomoto Stadium in Tokyo between August 27th and 28th. BIGBANG has made an appearance during the festival each year since 2014. However, label mates iKON will make their appearance for the first time ever. It's not surprising the former group will make an appearance, especially since their popularity in Japan is very high. For instance they're the first foreign group to hold a Dome Concert for three consecutive years. During the Japan part of MADE 2015 World Tour, the group racked up an attendance of 911,000 fans to their 5-city tour held between November 2015 to February 2016.
iKON aren't doing too bad either when it comes to popularity. Their first album, "WELCOME BACK" was released in January and reached #1 on the Oricon Chart. With their Japan tour held in February 2016 the group attracted 146,000 fans. They recently released a new single, titled "#WYD (What You Doing)".